“Keep The Magic Alive!” An Interview With The Finest Toy Shop In The World. – Nick Simmons. “Keep The Magic Alive!” An Interview With The Finest Toy Shop In The World. Established in 1760, Hamleys is London’s longest running toy store. With it’s fun, thrills and creative passion for ‘fun, magic and experience’, the beloved toy shop captures the frivolous hearts and minds of the very young – to even the solidly established ‘I’m grown up’ very old. Whether it’s the chimes of Big Ben clocks, the smiles and sensation from the electrifying ‘entertainers’, the mystery of ‘Marvin’s Magic’, or even the most precious, ‘treasure for a lifetime’ presents you carry forever a lifetime with you…Hamleys has it all. 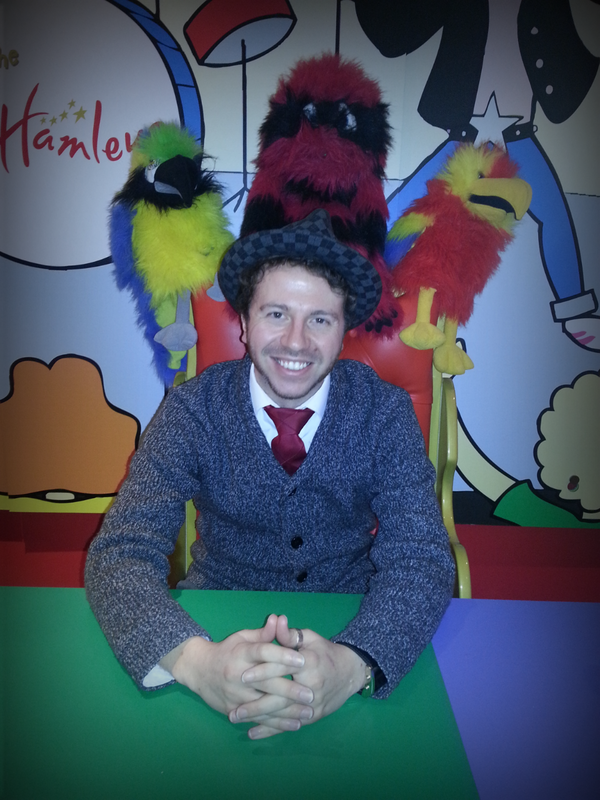 Five fun facts about Hamleys! Hamleys has over 5 million visitors a year. The success continued and in 1881 a new branch opened in London’s Regent Street. Nicholas: Today, I’m interviewing Pearce Richards, who works at Hamleys store in Cardiff, to understand how the ‘finest toy shop in the world’ spins it’s magic. Nicholas: Hello Pearce! How are you doing today? Pearce: I’m good Nick, how are you doing? Nicholas: I’m great thank you! Just to ask you a few questions about the actual store opening in Cardiff; if you could give me a brief background about the store – when did it launch? Pearce: The Hamleys store in Cardiff launched in October 2012, but actually opened on the 14th of November – so there was a lot of planning going in to it beforehand! I was taken on-board the magic of Hamleys on the 17th of October – and at the time I really felt like the ‘Willy Wonka’ of the toy store, if that’s how is best to put it! Hamleys head office flagship store in London decided to open here in Cardiff’s grand St. David 2 Shopping Centre during the period of August last year, so in the space of three months it was a VERY fast process…and then we finally opened the doors to everyone on November 14th, 2012. Nicholas: Pearce could you tell me what makes Cardiff’s store different to the London store? Do you think there are any aspects that make the store unique, given it is in the heart of the Welsh capital? Pearce: Well, the launch of this store was to make it ‘regionalised’, as, of course the London store is the ‘mother ship’. The beauty I find of Hamleys is that – no matter where you are, no matter where you come from, people travel from all over the world to come and see us. We provide a platform stage of entertainment that goes across countries – because, at the heart of it all, it is about bringing people together through the magic and fun of our products and branded service. And, as you can imagine, when people come to Hamleys, especially families – for that ‘once a year’ special occasion – if you come and see us here at Hamleys Cardiff, you will never feel out of place! Nicholas: So, do you almost feel like there’s a community sense here, bringing in new people everyday? Pearce: Absolutely! That was the whole point of opening the store here! Given my role, as the ‘marketing and events co-ordinator’, the Hamleys store here required an individual who knows the local area, local suppliers, rather than if someone from London, who would be coming here ‘blind’, and everything would have to be built up from the start. I’m very fortunate in my position as I am making new partnerships with people and respectful contacts – that was very much in the back of their minds opening this store. It is unique in that it is a ‘regionalised’ store. Nicholas: Are you someone who has had a great impact on the store with the Welsh community? But also, are you engaged with the local culture around Cardiff, with Hamleys promotions and marketing that you specialise in? Pearce: Oh, absolutely. That’s something which is key to my plans – community engagement – working with schools, working with councils. The first thing I wanted to do when I arrived here was put the Hamley bear on the ‘open top bus’ and send them around Cardiff, and so we took pictures of it inside the Wales “Millennium centre” in Cardiff Bay, and the Millennium Stadium. The one thing I didn’t want was people taking the idea of a big national company coming in! Instead, we have integrated Hamleys in Cardiff seamlessly in to the Welsh culture, and along the journey of Hamleys in Cardiff – to make partnerships and make great, lasting friendships with the wealth of business on offer here in the capital. Nicholas: It’s quite a unique shop then, isn’t it Pearce? I mean, you don’t really hear of Hamleys being opened in locations beyond the flagship store in London of course, or the subsidiary locations including Glasgow, and Dublin? Pearce: Exactly. Everyone was really excited! When we handed leaflets out in the city centre in the build up to the stores opening you wouldn’t believe how overwhelmed and excited people be! Nicholas: It creates a buzz around it then? Pearce: Yes! Absolutely, it took me by surprise really. Nicholas: It really is a prestigious, ‘one of it’s kind’ brand! I mean, people actually go to London purely for it, just as something like Harrods – it’s one of those ‘must see” attractions or destinations. You actually have to go there to experience it, regardless of whether you actually go inside and buy anything – it’s the customer experience that counts and that’s what people love and that’s why people keep on coming back for more ‘magic’. That’s how I see it, Pearce. Pearce: That’s what people have said, and you know people have said this is going to save them miles of travelling up to Hamleys in London for Christmas now! A lot of people actually prefer this store, however, I can’t really compare the two (Cardiff and London) as it’s seven floors, its HUGE , it is ‘THE DADDY’ of the Hamley stores! Nicholas: But you still do everything that you can within this space, which is very impressive Pearce! Pearce: Exactly. And it would be amazing if we had another floor but the space we have allows us to show the demonstrators and the toys! It has everything that you would expect in London you have here. Actually, we have a lot more new products on offer, as well. The great thing about this store is because we’re opening up to franchisee’s abroad, this store is the one which everything gets sent to as we have all the new fixtures, fittings and new designs. So this is the jewel, or the crown, I guess. Nicholas: Could you give me an example of a franchisee who you deal or collaborate with? 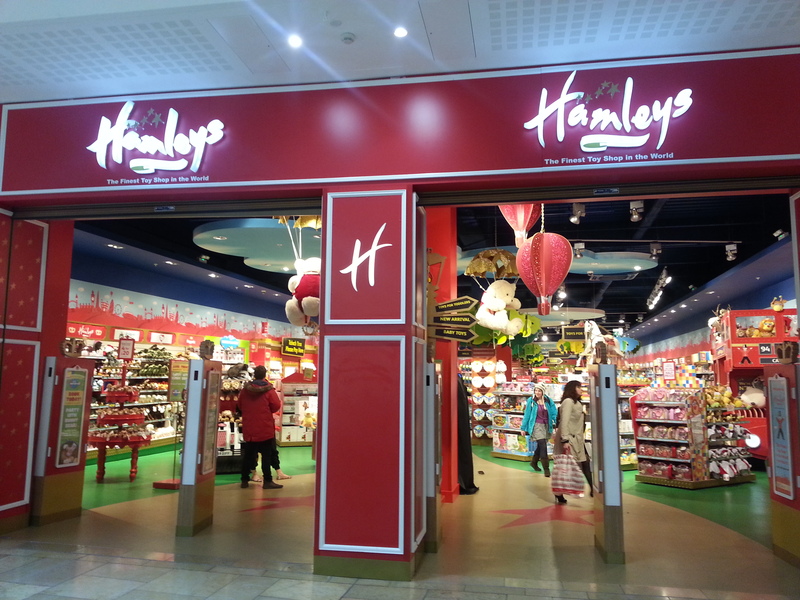 Pearce: We work with Scandinavian companies, and Denmark and Sweden and have had a Hamleys for the last six years. Historically, we have recently taken over by the French company, “Groupe Ludendo”, which is amazing, because they have over three hundred stores in Europe. So I think we have plans on opening stores in mainland Europe. We also currently have stores in Dubai and Egypt. Nicholas: Could you give me information on any of your achievements, or any time where you feel you have gone above and beyond the call of duty where you could really feel like your respected in this workplace? Pearce: I think I come from a different angle, and the way I feel with people and treat customers. I always want to go above and beyond. I’m always very friendly and very open and welcoming, to which, I hope, feeds off to my great team! I think it has always been Hamleys way to be friendly and cheerful and helpful. I think I myself have made a lot of strong relationships with local companies, which has included Cardiff City Football Club (CCFC), and St. David’s Hall. Nicholas: Pearce, could I ask more about your professional background? But also, the question I’m sure a lot of people would like to know – what made you want to work at Hamleys! Pearce: Well, first of all, it’s Hamleys! I mean, who doesn’t want to work for Hamleys? Nicholas: It is a dream for most people! Pearce: Exactly! I mean, when I found out I got the job, the focus was centred on the ‘magic and fun of theatre!’ And when they called me in to Hamleys, I was just bouncing around the room! A lot of my background is largely based around events and marketing, but also music and record labels. Nicholas: So what does your role entail? And could you give me the full name of your position? Pearce: It’s a combination of marketing and events managements, so of course, there are other roles including a store manager, assistant manager, a duty manager, and duty leaders, who run our store, but I’m creating a lot of the campaigns and adverts to make the experience as much fun as possible for everyone visiting the store! Nicholas: And so coming on that, do you see yourself as an individual in your field who is far more motivated by the passion and rewards your job entails; taking your role to the next level of creativity? Pearce: Absolutely, I mean, from my particular goals, I really enjoy my job in being able to not only have fun, but create as much of a magical experience for the children and older customers who come in here and see us all. Nicholas: Do you think that ‘magical experience’ goes far beyond the child’s imagination in to the adult shoppers as well? Pearce: Oh, definitely! Yeh, it brings them back in to their childhood as they may have remembered it! I don’t want to alienate people and let it just be a ‘toy store’ for children, we want to bring the adults in and them to go back to their childhood! Nicholas: A never growing up, kind of experience then? So, I suppose, that brings me on to my next question! What does your role bring which effectively impacts how customers see the store in Cardiff? Or at least how the Hamleys is viewed, rather than just a ‘child’s play thing’? If you understand what I mean! Pearce: Can you explain further! Nicholas: Sure. I mean, in terms of how toys are seen, and if they extend beyond the enjoyment of a young child? Does an adult view it more than just a childhood memory? Do they get more involved in the ‘magic’ than you think? Pearce: Well, through our demonstrations, we allow children and adults to play with the toys and interact. 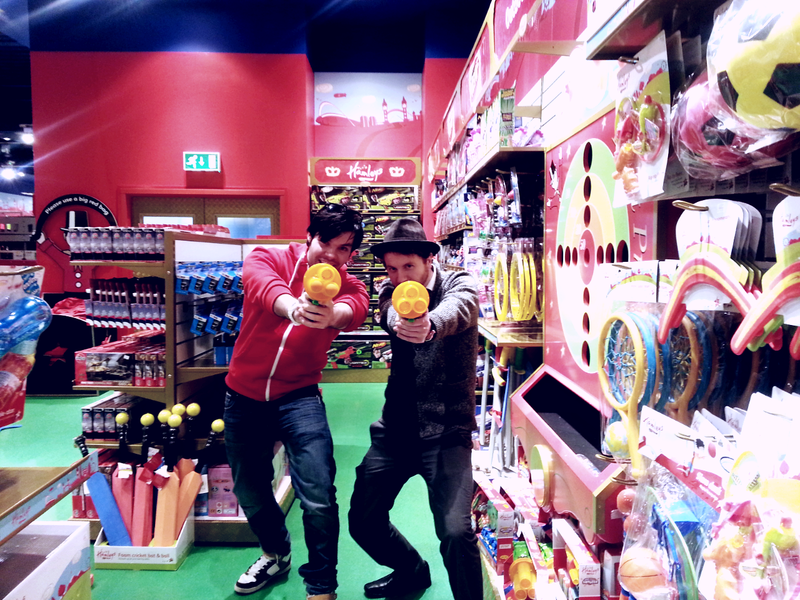 I mean, in Hamleys, there is nothing much else you can do other than to play with the toys and look at the toys! So, in that sense, I think customers who come in here are offered them to try them out, and that’s where Hamleys is like no other store! It’s not just a ‘supermarket experience’, where toys are only on the shelves, and where you are browsing – in Hamleys – you can actually try out what is on offer, and experience the ‘magic’. Nicholas: So you feel like this shop takes you in to a different realm or world; almost like adventuring in to ‘Disney World’ or ‘The Wizard of Oz’! It takes you in that place, and when you come out, you feel quite taken aback! Because it’s something that you don’t quite experience everyday if you don’t come around these kinds of places? Pearce: That’s great, because if the customers, and much like yourself, leave with that feeling then that’s amazing! Nicholas: You know Pearce, I think it is the whole customer experience! When even you walk past and your assistants will salute people – I think it is all part of Hamleys integration with the fascination and intrigue of London’s culture, The Royal Family, Buckingham Palace and the Soldiers. But, I think it also is part of that kind of mystery and fantasy – is all that brings in old and new customers? So I think, on that respect, it’s brilliant what you do! Pearce: That’s true, and that’s perfect – that’s exactly what we strive for! Nicholas: Although you are making the ‘magic’ behind the scenes of the store, do you always have a certain responsibility as to how designs, roles and duties are executed on the shop floor? Pearce: I think so! I mean, I manage a team of eight entertainers – and whatever we do, I will discuss with the store manager – but if we want to do something I think we’ve got the freedom to do that! That’s what I love about the role. Nicholas: So you almost feel like you have a mound of clay in your hands which you can sculpt and mould to your liking? And therefore your area for creativity goes far beyond what your job description entails? Pearce: I think I can push this role as far as I want to take it. It’s been a lot of hard work, Christmas time was crazy! I mean, I just started the role, I was juggling a million things! But now, I’m really settling in to the role a lot more, and my natural creativity is starting to come out again! So, for example, this year my aim is to start coming up with different concepts and having a bit of themed fun! So, adding more and more, ‘magic’, I suppose. Nicholas: And coming on the topic of ‘magic’, if there was anything you would like to add to the store here at Cardiff, and Hamleys, what would it be? Nicholas: And taking on-board all of your past and present experience, do you see yourself as someone who creates a positive impact on the community here? Pearce: I feel I have the respect of all my workforce, and that we are all in a happy working environment. I always have the time for people! Nicholas: Have the customers on the shop floor appreciated your influence on the shop and who you are! Pearce: Yes! It’s funny, because I’m the only one who wears a suit! What’s really funny is that this suit is my ‘fancy dress’. I mean this is kind of a façade…I wear fancy dress costumes all the time! I’m always happy to dress up! But I’m always focused and conduct myself professionally. Nicholas: What do you feel you offer to the Welsh public here? Pearce: It’s got to be the ‘fun’ really! Just creating the fun with the demonstrations and the bubble machines! Nicholas: And I’m sure you get a lot of fulfilment from that! Pearce: Yes! I remember when we had a competition when we opened, and we offered one hundred children the chance to be the first to come in at 6:30AM in the morning, and they just sprinted through the store. It was like nothing I had ever seen before – it was like something you would see in a movie, and that is something will always cherish and remember in my work at Hamleys. That was always going to be a highlight for me, I think. Nicholas: Pearce, thank you for taking the time to speak with me today. At London, Glasgow, Dublin, and now, Cardiff!